Any great nutrition program has a solid foundation. 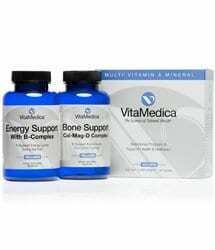 The Vitamedica Multi-Vitamin and Mineral provides just that…a foundation of basic vitamins plus minerals, vitamin C, calcium and B-complex. You will not find many multi’s that offer all these vitamins in one. This basic formulation will aid in efficacy of the other recommended therapeutic supplements found on this page as well as promote glowing skin, strong nails and shiny hair. Ensure that you obtain the right nutrients, at the right time, at optimal dosing by adding our Multi-Vitamin & Mineral to your healthy lifestyle.